Carve Me Bear! 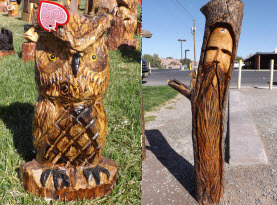 Chainsaw Carvings of Las Vegas, Nevada supplies the locals with unique chainsaw carvings created by master chainsaw master wielder Clark the Carver. 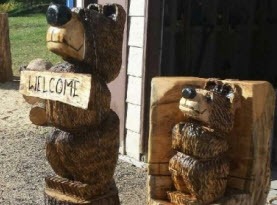 Sculpting masterpieces like; animals, wizards, mountain men, tikes and totems, furnishings, memorials, name signs, and so much more, Clack the Carver of Carve Me A Bear! 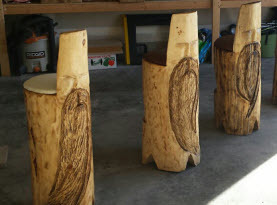 Chainsaw Carvings has amazing pieces ready for you to enjoy. 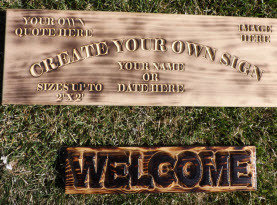 We also take custom orders if you desire something you don’t see in our gallery. Among the many animals Clark the Carver of Carve Me A Bear! Chainsaw Carvings in Las Vegas, Nevada can design are reindeer. Reindeer are remarkable and majestic animals. Also known as caribou, reindeer are known to live throughout Russia, Greenland, parts of Europe, Alaska, Canada, the United States, and of course the North Pole. The adorable reindeer are herbivores, consuming various plants, grass, and lichen type of moss. Reindeers have soft fur varying in different shades of brown, gray, or rusty shades with white necks and areas on their backs. Reindeer can get up to 5 feet tall with additional 3 feet of antlers and weigh 240-700 pounds. Both male (bucks) and females (does) have antlers, which are individually unique much like the human fingerprints, but they will shed the antlers each winter. Santa Claus’s reindeer form an important team of flying reindeer traditionally held to pull the sleigh of Santa Claus and help him deliver Christmas gifts. This reindeer squad consist of Dasher, Dancer, Prancer, Vixen, Comet, Cupid, Donner, Blitzen and of course Rudulph with his bright red nose! Whether you want one reindeer, nine or more, Clark the Carver can make a reindeer tag name plate identifying the traditional reindeer or perhaps a reindeer that you or a loved one have named! Whether you or a loved one are drawn to reindeer all year long or in light of the holiday season, Clark the Carver of Carve Me A Bear! Chainsaw Carvings can get your reindeer chainsaw carving for your home’s landscape or business’s foyer, contact us today!